It would be a bald-faced lie to tell you that the promise of driving the Ferrari LaFerrari doesn’t still make me, a driver of supercars, nervous as hell. Even having done deep testing on every Koenigsegg, various Bugatti Veyrons, and each model crafted by Pagani, somehow does not make things that much easier; the bottoms of my feet are sweating and fingers are fumbling a bit as I reach to open the swan door of “The” Ferrari. I am about ready to drive it around the hallowed test track of Fiorano not far from Maranello HQ. This has been an insane silly season of hypercars and it is likely to be a while before anything like it is able to happen again. Following the exotic calendar blip a while back that included both the 730-horsepower/1 000 Newton metres of torque Pagani Huayra and 1 140 hk/1 200 Nm Koenigsegg Agera R, the hyperness has shifted recently from boutique shops to relative mainstreamers. This latest hyperspasm includes the triad of the Porsche 918 Spyder (887ps/1 320Nm), the McLaren P1 (903ps/900Nm), and now this ultimate Ferrari named LaFerrari at 963 ps and 970 Nm. Prices range for the lot between €780 000 and €1,4 million, the LaFerrari right up there at €1,2 million. It has frankly been a perfectly conducted three-act opera. The plug-in 918 Spyder hybrid – driven in November 2013 – is wholly impressive in its technological brainstorm and it can absolutely crush the other two of this trio in green credentials. The P1 hybrid-boosted ground-hugger (March 2014) is exactly what I was hoping McLaren would do for me in this round: finally kick me viciously in the pants and make me feel damned close to one of their GT3 drivers. Before launching me out to the 3,0-km fun park at the Fiorano track, however, I was one of the selected to first head out onto the wild hilly two-lanes south of Maranello. 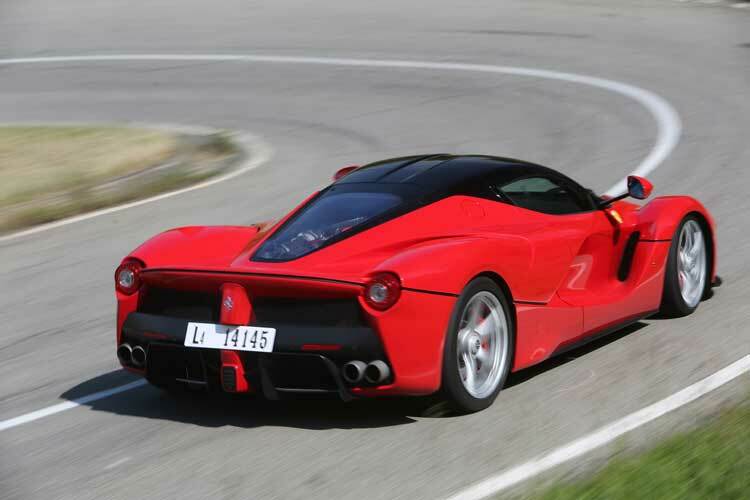 Many drivers who tested the LaFerrari in previous groups had been hit by torrential rain and I frankly cannot even imagine trying to do anything in this car under such conditions on hairpin-choked and oily Italian hill roads. Luckily, I didn’t have to as the morning sun shone brightly and temperatures were perfect for consistent engine cooling and tyre adhesion. Yet these fun roads are notoriously far from perfect and the rigid build of the LaFerrari chassis and body is not really meant to slum it through these everyday road conditions. Nonetheless, Ferrari has created a hypercar that can pull it off without feeling gawky, fragile, or utterly insane. I remember a similar first drive of the larger Enzo back in 2002, when what struck me most about it was the almost everyday drive capabilities of the monster when properly set up. Such is the case here with the generation-three two-mode magnetorheological dampers of the LaFerrari. The overall feel, responsiveness, and ride over rumpled and sometimes pitted two-lanes are just as accommodating yet decidedly more clear in their feedback. 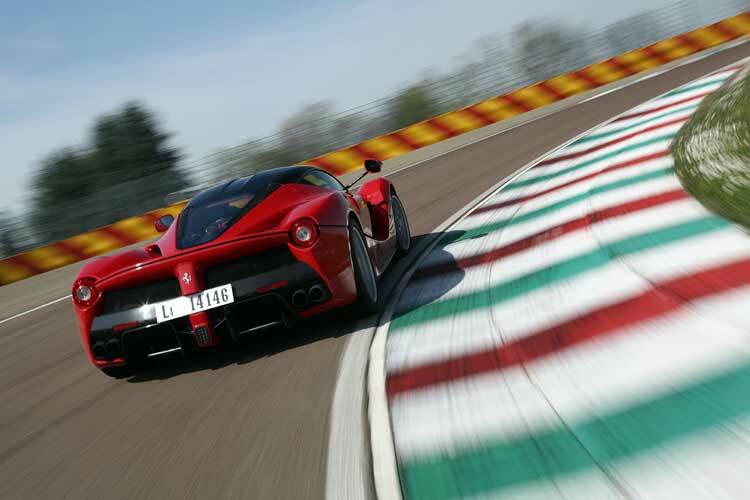 Undeniably it’s at the track where a total of ten laps, divided into two shots of five apiece, really and truly establishes the sheer breadth and depth of the LaFerrari’s capabilities in my inner ear. Let’s be honest: is the LaFerrari at its truest and finest really designed to cruise down the easy highway or even along public two-lanes with gorgeous sweepers? Is it nice and considerate and safe on any public road with a speed limit to drive any Ferrari like a Ferrari craves to be driven? No; it is designed and engineered for the track experience in proper conditions that permit us to throw all traffic laws to the wind. The “F140 FE” 800-ps 6,2-liter naturally aspirated and dry-sump V12 engine (6 262cc to be precise) with 700 Nm of torque makes just a tick less than screaming song on up to its healthy 9 250-rpm redline in the 1 420-kg LaFerrari versus all other V12 Ferraris with which I have pleasured myself. This is essentially the exact same engine fastened up front in the Ferrari F12Berlinetta, but there it cranks out 740 ps and 690 Nm for a car weighing 1 525 kgs. Then here is added the so-called “traction e-motor” which is the rearmost device on the whole powertrain, the seven-speed dual-clutch transmission getting sandwiched between it and the V12 at my back. This electric motor accounts for 163 further ps and 270 more Nm of mechanical twist. Put slightly simply, this booster motor energised by the 2,3-kWh lithium-ion battery pack is what fills the lower rev range on the V12 with so much forward thrust. The V12 is actually held back at lower revs while the e-motor is used there to fill the roll and result also in a bit better fuel efficiency versus the V12 doing everything by itself. This powertrain is all together referred to as “HY-KERS” and has been applied to the road directly from the extensive explorations with it in recent Formula 1 cars. 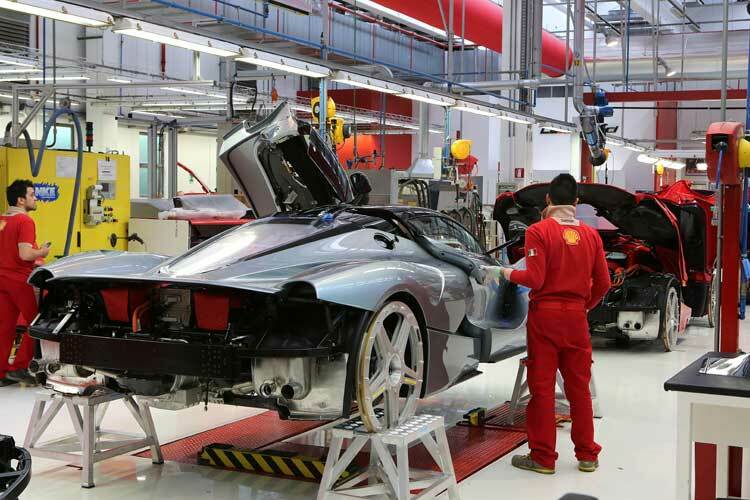 Ferrari says that there will never be a full EV mode programmed in to LaFerrari as the e-motor is strictly for boost purposes. The four contact patches that really ultimately allow the driving to take place are truly exceptional Pirelli P Zero Corsa tyres, 19-inch front and 20-inch rear. The physics of the situation are tremendous, with the LaFerrari sitting 35 millimetres lower than an Enzo and the driver’s hip point down 60 mms versus the Enzo sitting position. The car’s width is also 40 mms narrower versus Enzo, this point accentuated dramatically by the glass dome aero shape and the integration of the robust door sills into the doors themselves. Open the swan doors and the essential form of a Formula 1 car is there to see, and getting in and out of the LaFerrari, for both legs and head, is as easy as doing so in many less low-lying cars. The aerodynamics pick up where the recently tested 458 Speciale leaves off, with fully active front air inlets and underbody vents, and a showpiece air-brake system out back. 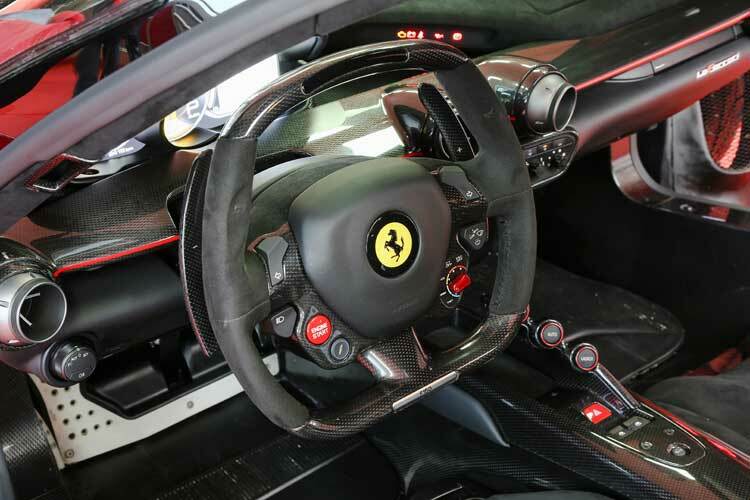 In full Race mode of the Ferrari manettino switch at the steering wheel, the downward forces generated at high speeds are blatant and strong. The Brembo carbon ceramic brakeset is enormous and taken straight from the Speciale. Couple these beefy discs with both the LaFerrari’s lighter weight, low stance, and massive air-braking assistance, and getting in full attack mode at the track gradually feels totally natural and no more risky than in any other rear-engined Ferrari. As I sit in the wrap-around cockpit, the squared carbon-fibre steering wheel is fully adjustable in a normal fashion, while a lever pulled at the lower right of the driver’s seat releases the pedal set toward me so I can adjust it using my legs. None of that is revolutionary, but it works to perfection when you consider the seats are fixed to the chassis and immovable. Buyers can get custom-formed seats in three basic sizes, or can get a fully customised seat molded to their every contour. The drive groove is so easy to get into with LaFerrari. Within a couple of laps, I have figured out the sensitivities of the throttle pedal and (especially) brake pedal, and those physics of the whole operation I talk about just take over. The manettino in CT OFF mode still produces a good amount of intrusive stability nannying, but, hell, wouldn’t you? This car is freakishly quick and way more sophisticated than its driver, so erring on safety’s side is not a criticism this time. Switching to the full-bore ESC OFF is the only way to get those famous controlled smokey burnings of Pirelli rubber through and out of the curves. And it’s amazingly easy and fun and repeatable at will. 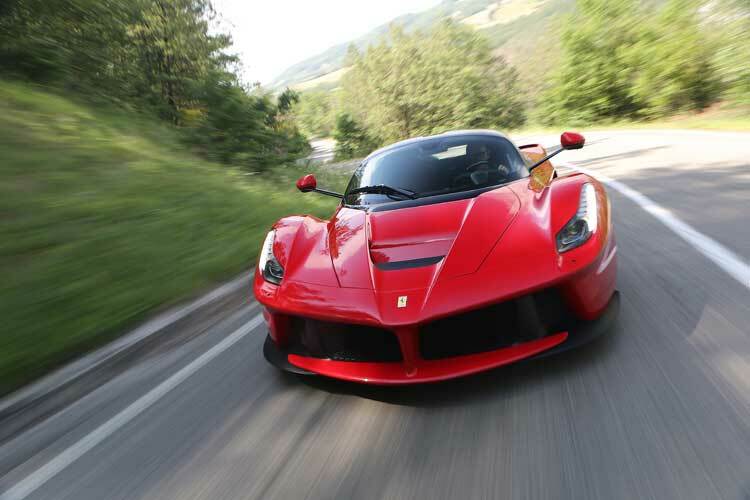 The LaFerrari is a full six seconds faster around the Fiorano track versus the stock Enzo, the acceleration to 60 miles per hour happening in 2,6 seconds or (assuredly) less. 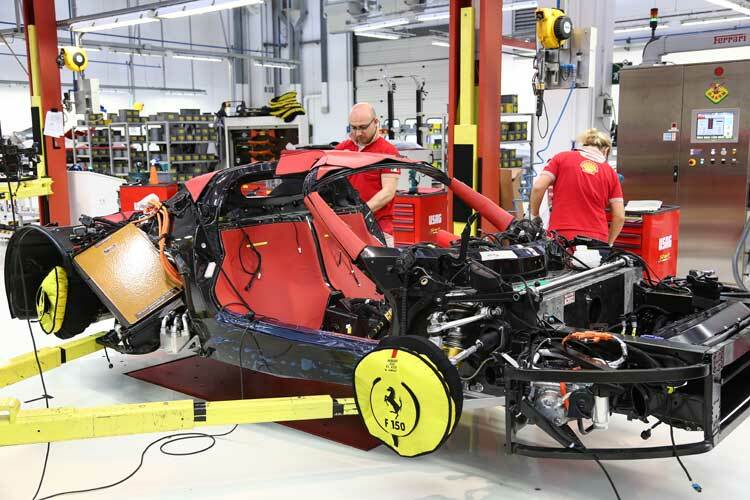 The 499 LaFerraris to be built and delivered are all sold and were all sold prior to the Geneva motor show in March 2013. 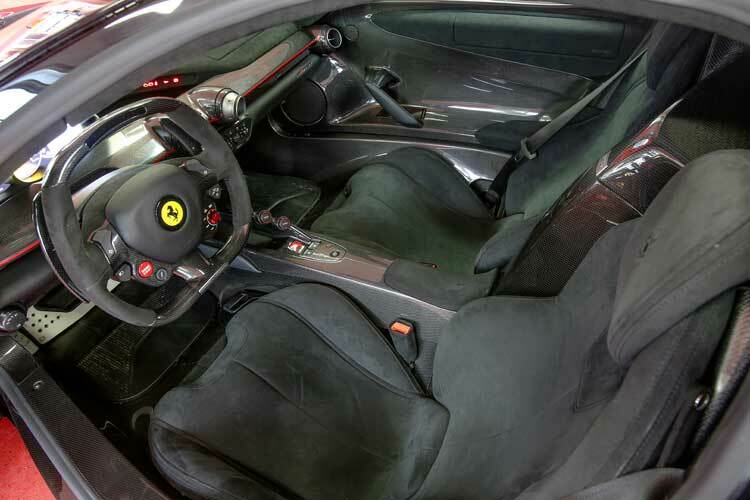 Requirements for ownership revolve around the buyer being a serious Ferrari collector, having recently purchased at least five production cars in the last few years. That would seem rather insane, but, I repeat, they all sold faster than Rolling Stones concert tickets. That is crazed brand loyalty. So, now we pause for a couple years at least of BMW M style sports cars and maybe a few Porsche 911 variants and the like. Is it all right to say that it might get boring? ?